Come hear the Sustainable Jazz Ensemble perform this Saturday at the opening night party for the Princeton Public Library's annual Environmental Film Festival. We'll start soon after the discussion following the excellent bicycle movie "Veer". We'll be playing music I composed since moving to Princeton six years ago, with titles like The Case of the Kidnapped Kalypso, Fresh Paint (composed while breathing latex fumes in a freshly painted room), Lejos de Aqui (Far from Here), Lunar Eclipse (composed while forgetting to check out the lunar eclipse that was going on outside). Phil Orr's on piano, Jerry D'Anna's on bass, and I'll be playing saxophone. There will be some light refreshments available later in our performance, but you're welcome to byof, since it's happening around dinnertime. Info on all the extraordinary movies to be shown over the next two weeks can be found at http://www.princeton.lib.nj.us/peff/schedule.htm. 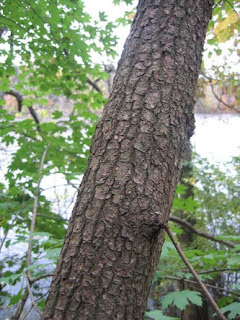 Oaks are among the most giving of trees. They play host to more than 500 species of butterflies and moths--more than any other kind of tree hereabouts. 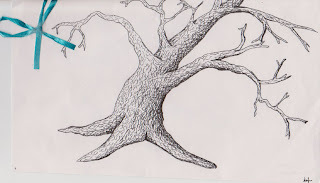 When I lived in the Midwest, my backyard looked out upon two massive bur oaks that, as the squirrels traveled their long limbs, seemed like whole cities unto themselves. You'd think, at this time of year, as trees stand stark against the wintry sky, that the oaks' giving would be done until spring. Most do appear lifeless and abandoned. So it was surprising to be walking in the neighborhood one recent sunny afternoon and look up to find an oak full of birds hard at work, harvesting a largely invisible crop. Four bluejays, three nuthatches, two mourning doves, and a flicker in a bare tree, or so a song might go. Most acrobatic were the bluejays, clinging upside down to wispy twigs to pluck the pin oak's small acorns, then bracing the morsels between their feet while they pecked them open. On this day of giving, a time to celebrate trees, both giving and given. 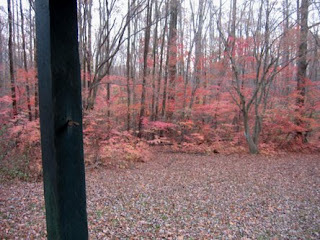 In fall, the local woods become a color-coded forest, making it easy to tell at a glance what species are growing where. Trying to take at least some advantage of this, I headed out in a car to survey where Asian photinia has invaded our nature preserves. The combination of its yellowish orange color and customary growth form aid in identification from the road. Here's a new invasion getting going up on Mt. Lucas. 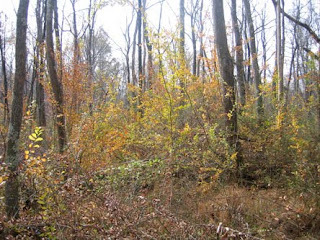 Once Photinia has lost its leaves, the honeysuckles are still green, revealing just how extensive is their invasion of the woods. 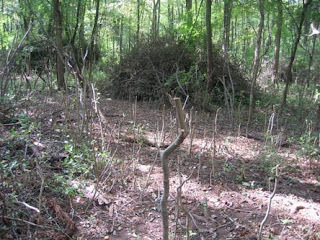 That they hold their leaves long after native woody plants have dropped theirs suggests that the exotic honeysuckles evolved in a climate with a longer growing season. Have a spicebush! 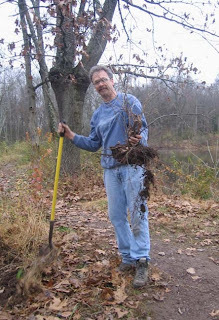 As part of a planting project around Mountain Lakes House, Friends of Princeton Open Space board member Tim Patrick-Miller led a plant rescue on the old lower dam at Mountain Lakes. The dam will be enlarged this coming year, burying all existing vegetation. 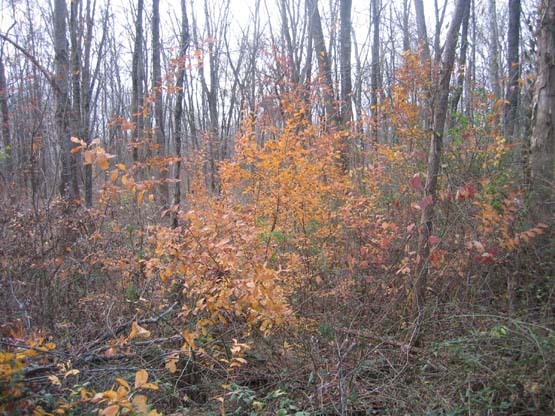 All told, we rescued five spicebush shrubs and four swamp rose. In another project, initiated by Princeton resident Bill Sachs, we planted 20 butternut seeds outdoors, then covered them with metal screening to prevent pillaging by squirrels. The butternut is a rare native tree threatened by an imported canker disease that is reducing their numbers even further. Bill, who edits the Nutshell, a newsletter for the Northern Nutgrowers Association, has been scouting out where these trees can still be found in Princeton. Until we get DNA analysis, we won't know whether the trees found are the native butternut, or a hybrid with an imported species. Both these shrubs are native, but I've never seen them in the wild. That may have to do with their natural range being the southeast. They've been widely planted in the north, for obvious reasons. The first is oak-leaved hydrangia (Hydrangia quercifolia). 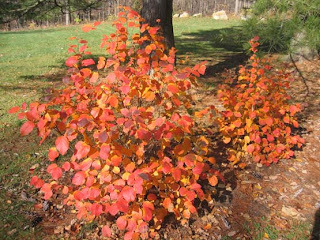 This dwarf fothergilla (Fothergilla gardenii) was planted at Mountain Lakes House, and has been left alone by the deer. 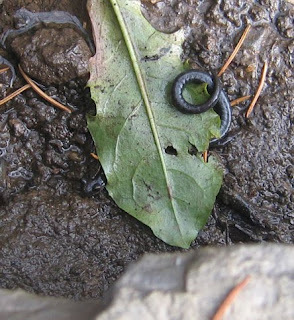 While digging around the foundation of the historic Veblen House (soil and landscape timbers had been pushed up against the wood siding--not a great way to preserve wood), I came across some salamanders. One played a game of peekaboo, crawling under a dandelion leaf after I let it go. "Snakes with legs" is one way to describe how they move, but their soft skin and improbably tiny feet confer an air of vulnerability. There are lots of red berries in the woods right now. Consistent summer rains have made for a bumper crop. Here's some help in distinguishing between them all. Asian photinia (Photinia villosa) is a robust exotic shrub that reaches twenty feet high and can be found singly or in dense stands. 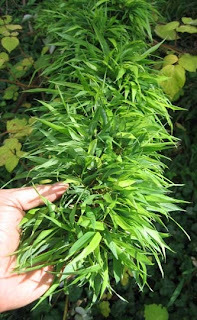 The leaves are "obovate", meaning they are often widest towards the tip. 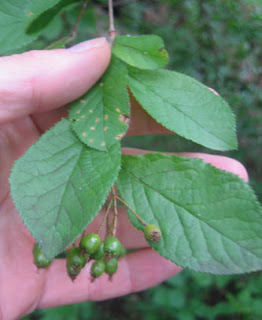 The berries are in terminal clusters. 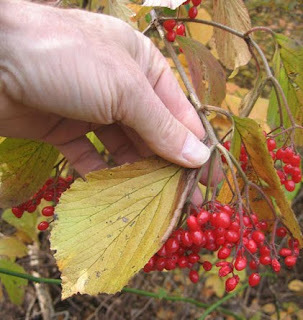 Winterberry (Ilex vericillata) is a native shrub typically found in lowlands. 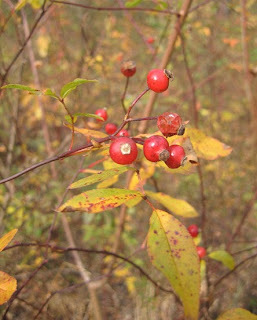 At Mountain Lakes, its leaves are still showing a little green, and the berries are tight against the stem, rather than in terminal clusters. Swamp rose (Rosa palustris) is another native, also found in lowlands. Its hips are larger than those of the exotic multiflora rose, and its thorns are not curved backwards like the fishhook-shaped thorns of multiflora rose. Also, the thorns of swamp rose are more dense towards the base--the opposite pattern found on multiflora. I'm calling this Viburnum dilitatum, the linden Viburnum--an exotic shrub that is proving fairly invasive. It's leaves could be mistaken for the native Viburnum dentatum, but are wavier and less toothed along the edges. 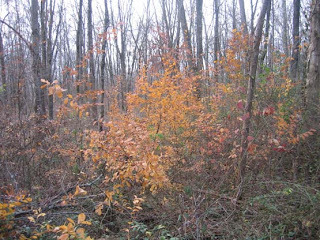 Asian Photinia (Photinia villosa) is a shrub that land managers in the Princeton area are targeting for removal from natural areas. It was sold by Princeton nurseries many decades ago, and has begun invading the local woodlands. 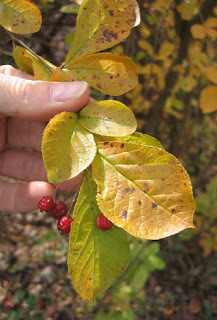 Why are we so worried about this shrub that turns a pretty golden color in the fall, with bright red berries? There are many reasons. 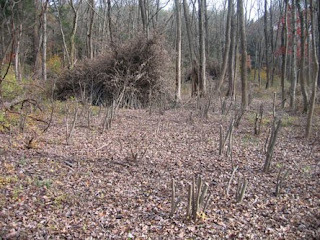 For one, the shrub appears not to be edible for wildlife, and 2) the shrub has shown a capacity to out-compete the native shrubs and forbs wildlife do use for food. The spreading monoculture of Photinia in the forest understory is rendering the landscape less and less hospitable for the native diversity we seek to nurture. 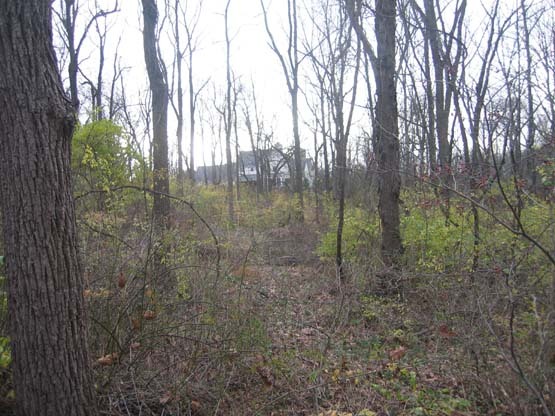 An additional reason for focusing on Photinia is that it has yet to spread across New Jersey. Action now in the Princeton area could prevent Photinia from becoming a statewide pest. This is a typical sight under berry-producing Photinias: a dense clustering of seedlings that leaves little or no room for native species to survive. Photinia is very easy to spot this time of year. 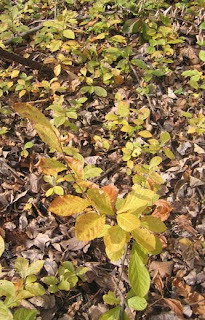 Nearly all native species have already dropped their leaves, making the woods a color coded picture of various invasive species. Honeysuckle shrub leaves are still bright green, Photinia's are golden yellow. Here's what the woods looks like after a very dense patch of Photinia has been cut and stacked. Not as pretty, to be sure, but it's the first step in restoring a more edible native landscape for wildlife that will also be pleasing to the eye. Homeowners are encouraged to identify and remove Photinia. Though it may be appealing from the standpoint of its deer resistance, the spread of the berries threatens the ecological balance far beyond the boundaries of one's backyard. A Friends of Princeton Open Space board member found this caterpillar on her front door one day in July, and just recently found out what it is. Though we have lots of the butterfly's favorite host plants--spicebush and sassafras--growing in Princeton woodlands, particularly since the browsing pressure of deer has been reduced, I have never seen one of these caterpillars. The one that showed up at Brownlee McKee's door might have something to do with a spicebush her landscaper planted just two weeks prior, and so it's hard to know if this particular caterpillar originated in Princeton, or was transported with the shrub from some distant nursery. Below are her notes, and a link she found to a wonderful photo portrait of all the different shapes a spicebush swallowtail takes as it grows towards adulthood. Thanks to Brownlee for sending the photo and info. 07/16/09 Spicebush Swallowtail caterpillar on front door of house within a couple of weeks after setting a Spicebush 15 feet from the door. How the 'pillar got there, past 10 feet of boxwoods, over five feet of brick paving, and a foot or two up the door, is a mystery. It was a striking sight, with the sun bringing out its bright yellow against the dark green of the door. In this picture the pale background and some shadow dulls the bright yellow. Here's a website with many photos and more info. At the old Veblen farmstead at Herrontown Woods, the delicate leaves of Japanese maple decorate the woods next to the old cottage that once served as the world famous mathematician's study. Japanese maple in all its varieties is one of the most gorgeous trees around, but the way it can sprout copiously in people's gardens has always made me wonder what could happen if it got loose in the woods. That's what's happening at Herrontown Woods--the kinda scary aspect if one values native diversity in the natural areas people have worked so hard to preserve. Sure is pretty, but the wildlife may not be sitting pretty if they find it inedible. It's a pleasure to encounter a new kind of native tree for the first time--one rooted in this continent's deep history, a new-old friend. I first heard of butternuts (Juglans cinerea) as a rare relative of the walnut that was becoming even more rare due to an imported canker disease. An opportunity to finally see one came after meeting Bill Sachs--Princeton resident and editor of the Northern Nut Growers Association newsletter, The Nutshell--who is beginning a quiet campaign to find and nurture various kinds of native nut-bearing trees in town. He recently recruited me as an extra pair of eyes to search for any companions to a butternut he had found in a private woodlot near Carnegie Lake. 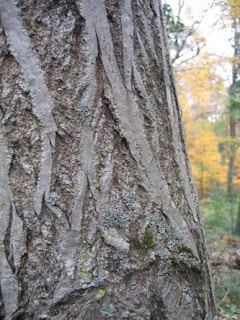 Butternuts have distinctive bark, with lots of long, flat "ski runs" zigzagging down the trunk. Red oaks have this feature as well, but the vertical plates are not nearly so dense. We soon found a second tree, with many nuts beneath it. 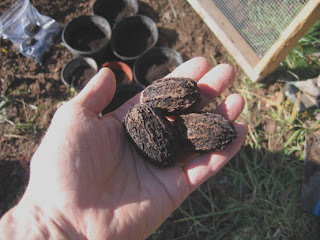 The nuts look like oblong walnuts. Whether these trees are pure butternuts or are the result of hybridization with Japanese walnuts will have to await genetic analysis. 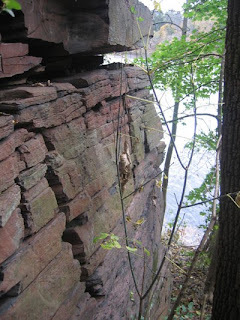 Later in the search, we came upon a lovely overlook of Lake Carnegie, with rock bluffs populated by uncommon species. 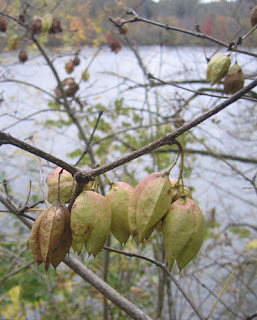 This photo shows bladdernut, whose seeds (not really nuts) can be found inside the "bladders." This is the third population of this native shrub that I've found in Princeton. The rock bluffs have an ancient quality to them, as if the rock has been buckling slowly over the eons from its own weight. Though we didn't find any more butternuts, Bill also identified a persimmon tree by its bark--a female with a few fruits still clinging to the branches. 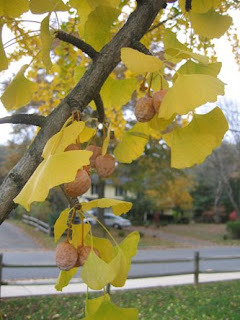 This is a good time of year to spot Gingko trees (Gingko biloba), a commonly planted tree in Princeton. It is a "living fossil", meaning that the western world knew it only from fossil evidence before it was discovered growing in China. Its bright yellow foliage stands out now, with leaves clustered along lanky branches. The leaves grow off of "short shoots" that project from the branch (see second photo). Female gingkos are a mixed blessing, as they litter the ground with malodorous fruits. One owner of a large female tree told me he used the odor to advantage, by dumping the fruits back in the woods where some teenagers had occasionally been getting together to drink. 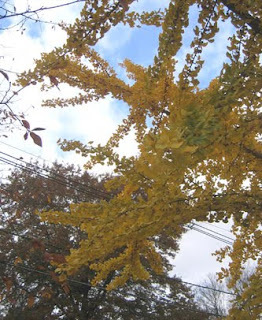 The gingko in these photos is at Little Brook Elementary. It will be interesting to see how quickly it sheds its leaves. Some drop them all in a day. but nature obviously doesn't read books on how to garden. 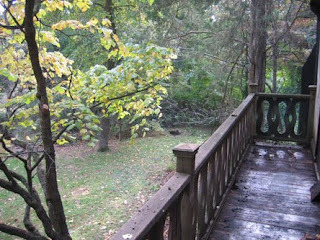 Ten years worth of leaves have accumulated here, on this balcony of the county-owned Veblen House, and all the organisms that make a living by turning leaves into rich fertilizer took notice and set up shop. 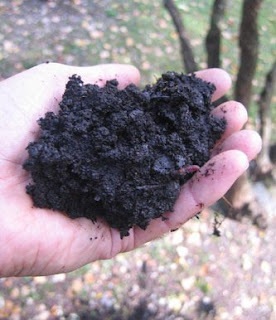 For compost connoisseurs, it doesn't get any better than this. The "black gold" was produced with 100% leaves and zero human effort. 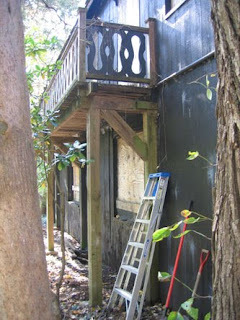 Notice the earthworm, whose capacity to reach the balcony was the subject of some speculation. They are not known for their leaping ability, and have never been seen wiggling up the sides of houses. 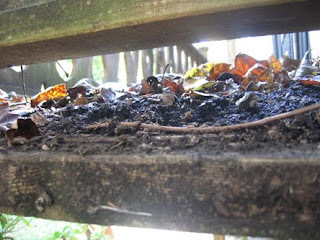 One theory offered is that an earthworm laid eggs on a leaf, which then blew up to the balcony. Maybe the daredevils among them hitchhike on the legs of birds. 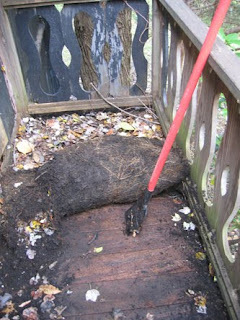 Virginia creeper knows how to climb a house, and quickly turned some of this rich leaf mold into root-filled sod. 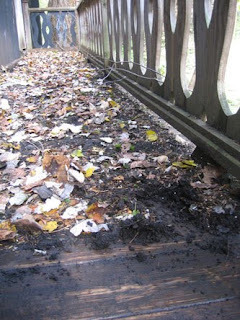 Fortunately, the decomposers took more interest in the leaves than the balcony, so that it's still possible to enjoy a fine view of the garden, newly sprinkled with compost from ten feet up. 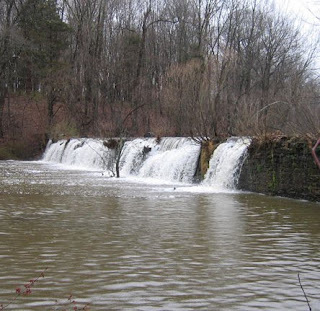 For many years, Princeton township has been making plans to restore the historic dams at Mountain Lakes, which were originally built to collect ice for Princeton's ice boxes in the days before refrigerators. Over the past century, the two dams have weakened, and the lakes have filled in with sediment. The upper lake, for instance, was originally 7 feet deep, but now has only a foot of water. 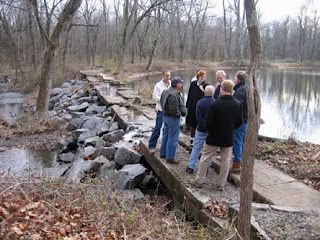 Only in the past year, when an anonymous donor offered to fund the $2 million project, has the restoration moved beyond the planning stage.In the photo, township engineers and historians meet on the lower spillway to discuss details of the restoration plan. The large boulders piled against the dam are temporary reinforcement for the buckling spillway. 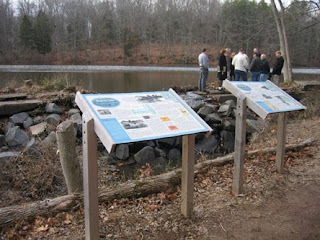 Interpretive signs tell the history of the ice business that once included two 3-story barns to store blocks of ice just below the dam. Hay from nearby fields was used to insulate the barns, which could keep ice for up to two years. 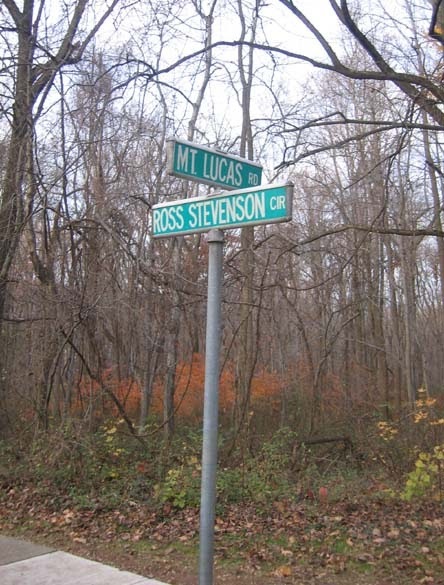 The restoration will include a dredging of the two lakes, and is scheduled to begin in May, 2010. 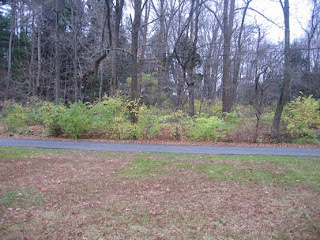 It looks benign, green like all the other plants in the forest, with ornamental white flowers in the spring and golden foliage and red berries in the fall. But Asian Photinia (Photinia villosa) has started quietly taking over Mountain Lakes. In some areas of the park, it has formed a monoculture in the understory, shading out all other plant species. No diversity means very limited food choices for wildlife. So that other species will have a chance to grow, the Friends of Princeton Open Space began this year a campaign to dramatically reduce the Photinia population at Mountain Lakes. This is what the woods looks like after a dense stand of Photinia has been removed by our extraordinary volunteer, Andrew Thornton. Other than a few stray ferns, there is nothing native growing here beneath the trees. The cut Photinia has been piled for wildlife habitat. The next step will be to replant the area with natives, or encourage whatever natives sprout. 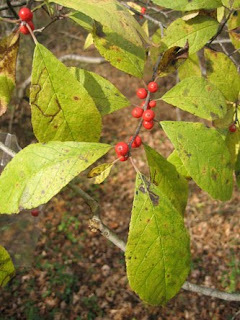 One of the native species that will benefit from Photinia removal is the spicebush (Lindera benzoin), which forms energy-rich berries in the fall. and a silent auction featuring the beautiful paintings created that day. On Sunday, October 4th, Friends of Princeton Open Space will celebrate its 40th birthday and many successful land preservation projects in Princeton. As part of this community-building event, plein air painters will come to Mountain Lakes Preserve to capture the beauty of our lakes, woods and fields on canvas. It's enough to make one think that all of one's actions, no matter how seemingly scattered, are somehow connected. If I hadn't taken up the cause of saving the Veblen House in Herrontown Woods, I would never have noticed a giant caterpillar crawling on a walnut branch in front of the house. 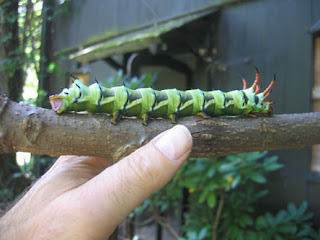 Not knowing what it was, I googled "giant horned caterpillar", and immediately found the name. Mark Johnson, Princeton's animal control officer, was on the scene, primarily to tell us how to get rid of a raccoon, two squirrels and a flying squirrel that have found the boarded up house to their liking. He said the lighter colored caterpillar is probably a female. The big, thick glove is for handling animals with teeth. 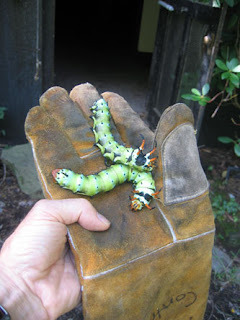 The caterpillars, scary as they look, proved to be harmless. "They are enormous in size, being five to six inches long and nearly 3/4-inch in diameter. 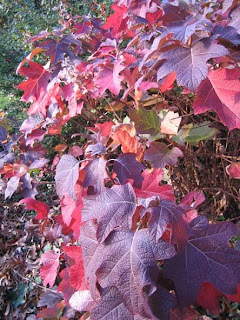 They feed for a period of 37 to 42 days on the leaves of hickory, walnut, butternut, pecan, ash, lilac, persimmon, sycamore, sumac and sweet gum. Larvae mature in late summer, wandering around searching for a place to burrow underground to pupate. Overwintering occurs in the pupal stage. The moth (Royal Walnut Moth) has a wingspan of five to six inches and is seen in midsummer. 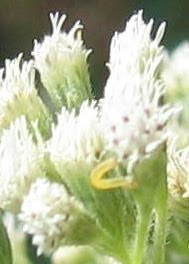 It has a long body covered with orange yellow hair. 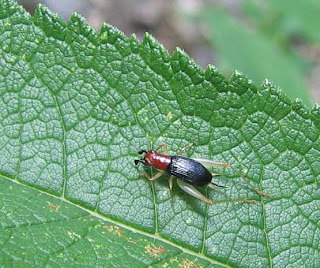 The forewings are gray with orange veins and yellow spots. The hindwings are primarily orange with scattered yellow patches." Monarchs usually have four wings--two on each side--but I found one on a bush at Littlebrook Elementary a couple days ago that had only three. That explained why it didn't fly away when I approached. 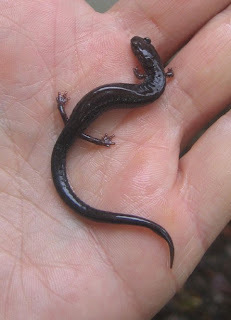 When I presented it with my finger, it crawled on, and I noticed it had only four legs, instead of the usual six. It looked freshly born out of its chrysalis, undamaged other than by a quirk of genetic fate. I showed it to some kids on the playground, and then called my daughter and her friend over to have a look. They adopted it instantly, and took it home, naming it "Buggie". 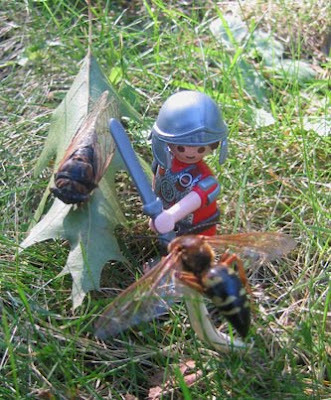 That afternoon, during a playdate, they reportedly taught Buggie to fly by dropping it from a treehouse, and also discovered that it would follow orders. 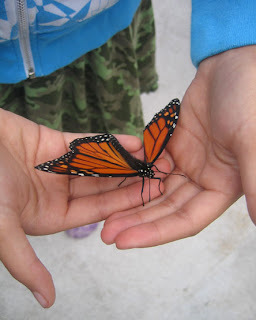 Clearly, a highly intelligent little butterfly! Overnight, it stayed outside in a terrarium, with a squished tomato for food. The next day, it traveled back to school for show and tell in a 4th grade classroom. My daughter, though, arrived home with a sad face. After school, while they were on the playground, Buggie flew up and kept right on going, despite having only three of its four wings. Monarchs, which fly all the way to Mexico for the winter, are notoriously strong flyers, but no one had expected three-winged Buggie to soar off into the wild blue yonder. I tried to console my daughter, who in her grief wanted to go to Petco to buy another pet. 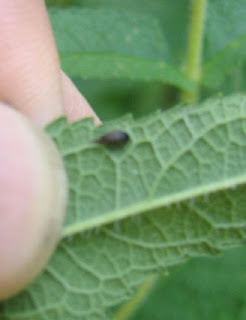 We finally headed out in search of a monarch egg or larva in various patches of milkweed I know about, but found nothing. I told her that she and her friend had done well, had fed Buggie and taught it to fly, and that now it was where it is supposed to be, with others of its kind, flying strong and far. She wasn't quite ready to feel good about this. "Beware of Bamboo"--wouldn't that make a good sign to post at the front gate? Most posts here lately have detailed the native abundance in my backyard. But just across the fence is a more typical Princeton scene. Bamboo, English ivy and Wineberry--all exotic invaders--thrive along a neglected fenceline, advancing imperiously into my yard when my back is turned. Bamboo is thought to be nearly impossible to weed out, but no beast can remain beastly forever without a source of energy. 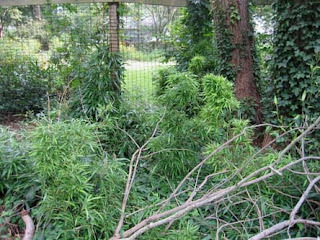 As described in a post in June, 2008, the hard part of the counter attack was done a couple years back, when my neighbor permitted me to cut the whole, dense, 20 foot high bamboo clone to the ground--on both sides of the fence. It then sent up a new batch of long stems, which I cut just as they were starting to leaf out. The whole idea was to prevent the Thing from collecting any new solar energy, forcing it to spend its reserves on new shoots that would get cut before they could send any energy down to the roots. Time, and the imperatives of metabolism, were on my side in this "drain the energy bank" approach to superweed combat. Last year, I again cut the new shoots down to the ground just as the stems were starting to send out leaves. This year, it sent up only a few strange stems, each crowded with unusually dense leaves. Grasping one stem, I felt like I was shaking hands with a woolly green bear out of Monsters Inc. And like in the movie, the monster has been acting mighty gentle of late. Fifteen minutes of lopping and it was time to declare victory, though I don't dare turn my back for long. 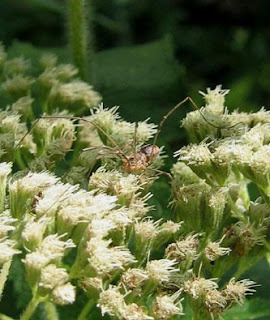 The boneset--those broad disks of white flowers held six feet aloft next to a backyard mini-pond--had for weeks been drawing a wildly diverse crowd of insects. The varied pollinators variously hovered and fed on the nectar, and I in turn hovered over them, documenting as best I could the local biodiversity with a well-aged Canon Powershot. The past several days, it seemed the flowers and their magic had faded. I had started to look elsewhere for action, as the air filled with the peeping of goldfinches feasting on the seeds of cutleaf coneflower. 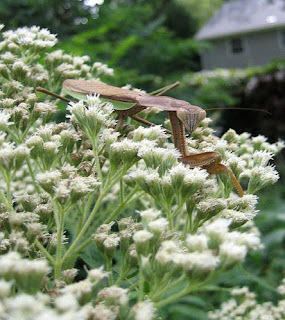 But then what looked like a stick fallen on one of the bonesets caught my eye, and I was back in the elevated sea of white, being stared down by a giant praying mantis. 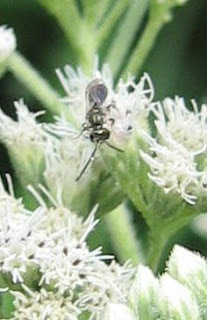 It had shown up a little late for the main course, with only a few scraps of insect life still visiting now. 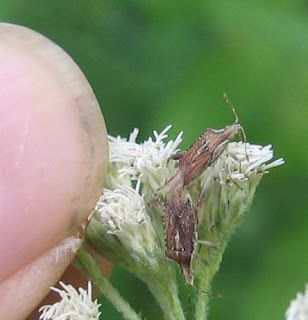 Still, once I started looking I was able to get photos of what might prove to be a dozen more species in a collection that could reach three figures. They were, of course, keeping their distance from the praying mantis. A fly with wings straight back. 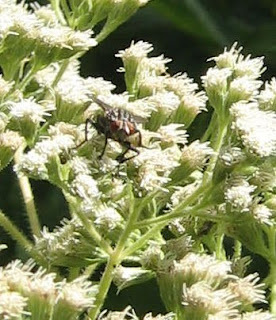 Another fly, larger, with a striped back and wings spread somewhat. A tiny fly dwarfed by a tiny flower. True bugs, who are remaining true to each other, at least for the moment. 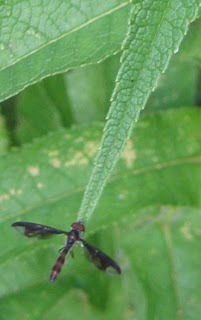 These creatures have been a fixture on the flowers for weeks. A weevily looking little character. 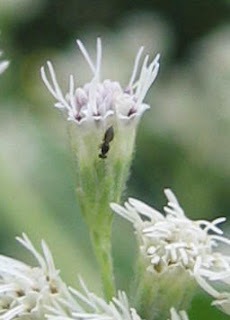 A tiny bee, which looks like all the other tiny black bees that have been the most numerous insect on the flowers over the past several weeks. 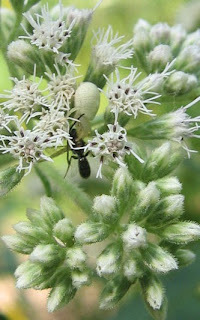 You might, like me, not at first see much more here than a lifeless tiny bee hanging just below the flowers. Whenever some insect isn't moving, it pays to take a closer look. 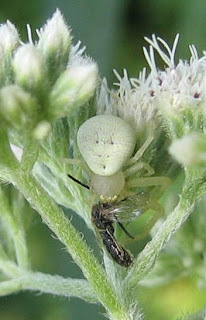 More predators have been showing up lately, including this white spider with a distinctive pattern on its back. Nice camouflage. Other new insects were as often perched on the leaves as on the flowers, including this crickety looking fellow. 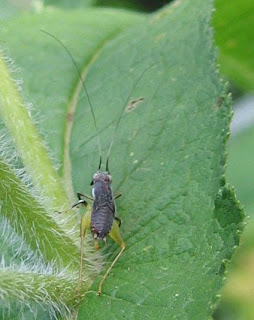 Another cricket with a different color scheme. 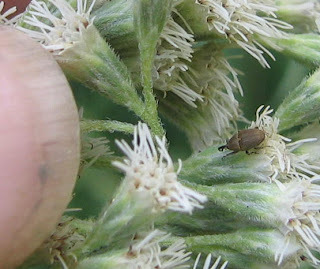 A tiny beetle-like thing with a tail. 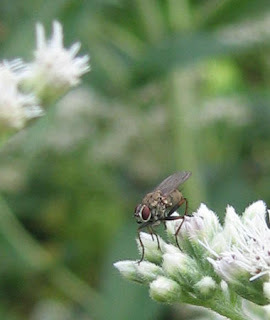 A fly, perhaps, with mottled wings, that hovered for long periods inbetween brief landings.